Kerala Spa Break is one of the most awaited holidays that a traveller can avail in this naturally bestowed state. Bestowed with the balmy climate, blissful beaches, abundant natural forest cover and an enchanting wealth of herbs and medicinal plants, Kerala is a favoured spa destination known for its curative and rejuvenating spa therapies. In fact, it is the only Indian state to practice this healing discipline with complete dedication. Kerala Spa Break is an opportunity to provide the mind, body and spirit the desired break from the tough schedules of life and provide it the elixir of life science, Ayurveda. Another good side for this tour is that it is spread over shorter durations of time. Upon arrival, meet Incredible India Tour Representative for assisted transfer to the spa beach resort in Kovalam. Set on an enchanting Arabian Sea coastline, this is a prominent spa destination in the God’s own country, Kerala. Here, the picture perfect setting allures the mind and the receptive spa massages, therapies and treatments relieve the body and soul from within. In all, a perfect combination for rejuvenating holiday. Overnight in Kovalam Resort. Though Ayurvedic and Spa treatments vary from person to person, still here we are providing a generic description of the spa therapies included in this Kerala Spa Break. For the first three mornings, an uplifting body massage followed by medicated bath and medicated steam bath will be given to the visitor. In the afternoon, the treatments of Shirodhara and Vetiver Scrub Bath. Shirodhara is a restorative treatment where the liquids like milk, buttermilk, coconut water and herbal oils are poured over the forehead. It is one of the steps involved in Panchakarma (purification of body). The continuous stream of liquids used in shirodhara is useful in relaxing the visitor. The next noon session treatment is Vetiver Scrub Bath. In Ayurveda, Vetiver or khus grass is known for its great benefits to the body, skin and also for its healing, anti-inflammatory and muscle relaxant properties. This kind of bath gives a cooling and tranquil effect to the body. The corrective diets during these Spa treatments also will restore the body balance and bring back the revitalized state of existence. Evenings are free to relax on the beach and witness the spectacular sunset on Kovalam beach. Overnight in spa resort. The next two days graduate to the new Ayurvedic treatments, so that the relaxed state of mind, body and soul are taken towards the next level. Pizhichil will be given to the visitors in the morning for one hour, followed by steam bath. This is a beautiful method combining the oil massage and heat treatment. 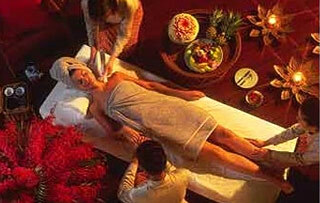 A gentle and synchronized massage is given to the visitor to build up the immunity and rejuvenation of the healthy life. In the afternoon, devote an hour session to Njavarakizhi wherein the body is given special massage through small linen bags filled with special kind of medicinal rice, Njavara after the generous application of oils over the whole body. The rice is cooked in cow’s milk and mixed with herbal decoction. The linen bags are also dipped in the same mixture and are applied throughout the body to encourage sweating. This procedure equips the visitor to face the stress and strains of busy lifestyle. Overnight in Kovalam’s spa resort. With a rejuvenated existence after the Kerala Spa Break, check out the Ayurveda resort and continue towards Thiruvananthapuram for your flight to onward destination.